When a ceiling fan light kit makes a pop sound and no longer works, this is what's known as a dead short. In a dead short, the line that's carrying the voltage goes straight to ground, whether due to a nick in the wire that touched a piece of metal or a wire that became loose and grounded itself. It's important to practice extreme caution around a piece of equipment that has a dead short because while it should trip the circuit breaker, it doesn't always, meaning that the wire may still be live inside the housing. Finding the problem in the light kit can be difficult but once you find it, it can be repaired rather easily. Ceiling fan with a light kit installed. Check the electrical panel to see if the dead short tripped the breaker. If the breaker is tripped, it will have a toggle switch that's slightly loose and positioned more to the center of the breaker instead of all the way to the side where the wire is connected to it. If the breaker is tripped, leave it that way, the circuit is off. If it isn't tripped, turn the breaker off. Remove all of the light bulbs from the ceiling fan's light kit but allow the bulbs time to cool off before you touch them. Remove all of the decorative glass shades or "bells" from the light kit after all of the bulbs are removed. There are small bolts that secure the shades in place. Loosen them one at a time with one hand while holding the shade in the other to prevent it from slipping out and landing on the floor. Remove the screws that secure the light kit to the body of the ceiling fan. There are usually three or four small screws that keep it in place. Place them inside a plastic cup or put them somewhere where you won't loose them. Use the touch-type voltage tester to check the wires for voltage before you disconnect them. Press the button on the tester and touch its tip to the wires to see if any are carrying voltage. If the tester beeps or lights up, then the power is still on to the fan. Try turning off additional breakers until you hit the correct one. 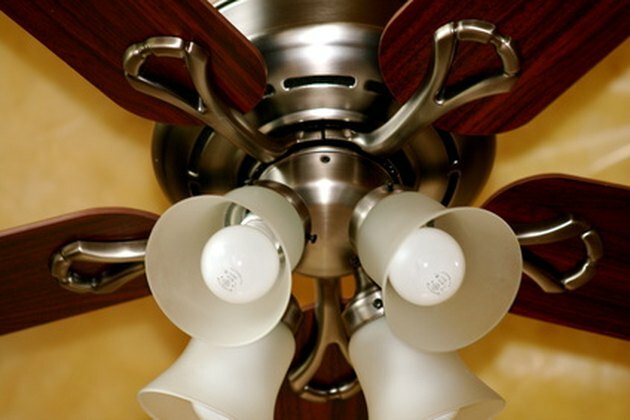 Disconnect the ceiling fan light kit from the fan by unplugging its power harness or by disconnecting the wires that connect the two together (depending on the type of fan you have). This will allow you to physically remove the light kit from the fan assembly. Take the light kit to a well-lit table. Using a flashlight, take a close look at the wires. Look for any pieces of wire that appear blackened, melted or burned. You also should be able to smell a burnt electrical odor so you may also be able to identify the location of the dead short with help from your nose. Check all of the wires, including those that are connected to the sockets. To do this, you may have to disassemble the socket from the light assembly. Look inside the socket to see if there is a screw that is holding it in place. If so, remove the screw and pull the socket out with a pair of needle-nose pliers. You may have to disconnect the wires at the other end of the light kit in order to pull the socket out far enough to check its connections. Look on the inside walls of the light kit for any scorch marks. This will help you locate the wire that caused the dead short as it will be in close proximity. Once you find the culprit wire, cut away its damaged area with wire strippers. Strip about 3/4 inch of insulation from each end and reconnect the two portions with a wire connector. Wrap electrical tape around the connection. If the dead short is within one of the socket branches, then you will have to re-run a new wire from the socket to the interior of the lighting assembly. Re-connect the lighting assembly to the ceiling fan. Then secure it back in place using the small screws that were removed earlier. Install all of the glass shades and light bulbs, then turn the power back on to the fan. If you left the breaker in the tripped position, you will have to push it all the way away from the wire side of the breaker and then back again to reset it. Test your fan's light kit by turning it on. Can You Switch a 15 Amp Circuit Breaker to a 20 Amp?